You could rate Richard Linklater’s new film “Boyhood” strictly on degree of difficulty, like it was an Olympic diver. Linklater has been making “Boyhood” since 1991, visiting the same group of actors each summer, adding more scenes as they grew older. 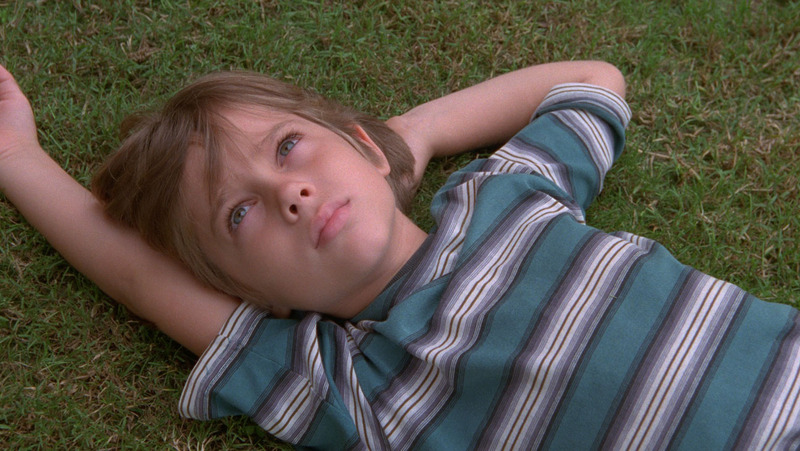 Ellar Coltrane was six when he was hired, Lorelei Linklater (Richard’s daughter) was eight. The film is built around Ellar, and Linklater had no way of knowing what kind of actor he’d grow up to be. Embarking on such a project was a tremendous leap of faith for all parties. Would I have been better off never seeing “Before Midnight”? This isn’t a question of whether I think “Before Midnight” is a good movie or not, or whether I “liked” it in any traditional sense. I think Richard Linklater’s third film featuring Julie Delpy and Ethan Hawke as loquacious paramours Jesse and Celine is a great film. The question I have is more fundamental, on a level more basic than that of a film critic: Would I have been better off never seeing “Before Midnight”? The first two films in the series were literate and romantic movies with the most memorable unresolved endings in movies. In 1995’s “Before Sunrise,” we followed twentysomethings Jesse and Celine as they met on a train in Vienna, decided to spend the day together on a whim, and had a 24-hour love affair with more depth and passion than most long-term romances. They parted at the end of the film, promising to meet back at the same spot in 6 months, and we left the theater figuring we’d never find out if they made that date. But hoping they would. In 2004’s “Before Sunset,” the pair meet up in Paris in their early 30s. Celine has come to Jesse’s book signing, and the pair walk around Paris, talking about their lives, the roads taken and not taken. Both are unhappy, both feel that connection rekindling. The movie ends in Celine’s apartment, Celine charming the socks off Jesse, Jesse about to miss his flight back to his wife and son. We don’t know if they actually get together. But hope they would. So, should we have left it there? By “Before Sunset, I and a lot of other fans became deeply invested in the love story of Jesse and Celine, in the notion that a connection that can change your life could always be just around the corner. Sure, there’s an element of romantic fantasy to that, but is that so bad? Except Linklater, Delpy and Hawke have something different in mind for “Midnight,” something of a bait-and-switch for fans of the series. The first hour of the movie is still based heavily on conversation, on long takes of Jesse and Celine talking about their lives to each other. (Although, they hardly ever talk about their daughters, which is so strange as to be significant.) But the similarity to the first two movies is deceptive — you notice that the conversation is a little more strained than before, with an undercurrent of sourness and disagreement. Jesse has to work harder to charm Celine, using silly voices or ironic come-ons. The film even makes clear that this is the first time in a while they’ve had lengthy conversations like this. Celine resents that she had to downshift her career when the girls were born, and it sets her off when Jesse raises the possibility of moving to Chicago to be nearer his son. And then the film takes all the romantic projection and goodwill built up over two-and-a-half movies and sandbags us with the last half hour, which is an on-screen marital fight as brutal and unrelenting as we’ve seen. All the tensions simmering during the film come boiling up to the surface, and we see the most unpleasant sides of Jesse and Celine on full display. It’s just awful to watch, like watching your parents fight. We learn things about the couple we never wanted to know. After giving us such a romantic, lofty view of life in the first two movies, “Midnight” brings us crashing down to earth. Love is hard, and just gets harder over time, the movie tells us. The dream can’t last. I think it’s the final scene, the supposed reconciliation between the two on the dock, that’s even harder on the notion of romantic idealism. Jesse wins over a begrudging Celine, at least temporarily, with a goofy story about being a time traveler from the future, telling her that they’ll get past this and everything will be fine someday. It’s a perfect bookend to the time-travel tale he told her on the train at the beginning of the first movie. Then, it seemed like a clever way to think about fate and chance. I think it’s going to take me a while to sort out my feelings about that. On the one hand, it’s a gutsy turn for the series to take, and it definitely has an impact. On the other hand, I don’t think I’m ready to embrace the cynicism of that turn, showing us that even one of Generation X’s great movie love affairs has to fall back to earth sometime. It’s a great movie, to be sure, one I still think about weeks later. But part of me wishes we could have left it back in that Paris apartment in 2004, Delpy channeling Nina Simone while an enchanted Hawke watches, and all possibilities lay before them.